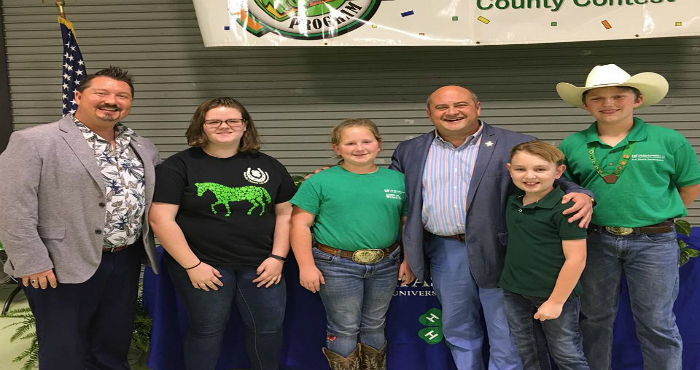 Crawfordville, Florida – Wakulla 4-H will hold the 2019 count-wide Tropicana Speech Competition on Thursday April 11, 2019 at 6 pm at the UF/IFAS Extension located at 84 Cedar Avenue in Crawfordville. 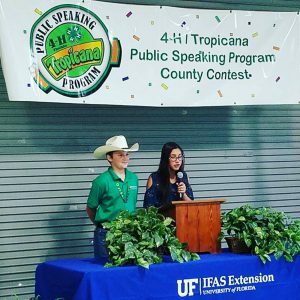 Since 1969, Tropicana has supported the 4‐H/Tropicana Public Speaking Program, an educational program aimed at teaching young people the techniques of effective public speaking. This educational program is designed to give students experience in the preparation and delivery of a speech. It is taught by classroom teachers and is incorporated into the individual teacher’s established lesson plan. With the guidance of their teachers, the participating students work on a speech of their choice. The experience culminates in classroom competitions where the top speakers from each class are chosen to participate in a countywide contest with winners from other schools. The 4-H/Tropicana Public Speaking Program meets Sunshine State Standards in Language Arts and Florida’s System of School Improvement and Accountability, Goal 3, and also assists teachers in helping their students achieve required benchmarks that are assessed by the Florida Comprehensive Assessment Test (FCAT) and Florida Writes Test. 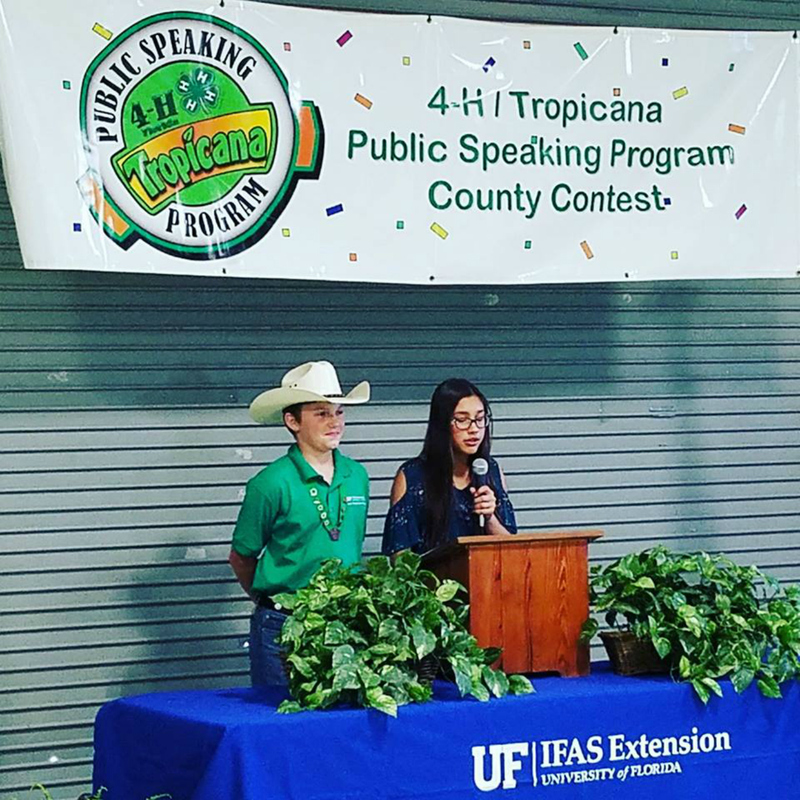 Tropicana and IFAS/University of Florida 4-H sponsors this program for 4th, 5th, and 6th grades in order to provide students with knowledge and experience in the preparation and delivery of a speech. The April 11 competition is a semi-final event. Students who compete that evening have become semi-finalists by winning at the school level. 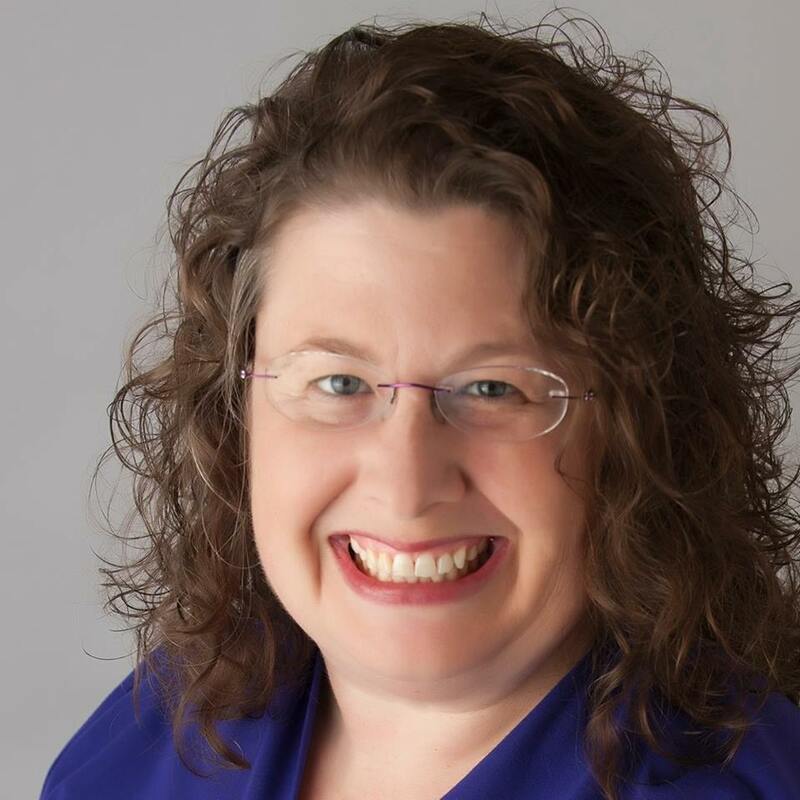 There are two grade divisions at the county level: 4th and 5th grade are combined into a single division and 6th grade is a separate division. Winners of the 4th/5th and 6th grade divisions will receive Tropicana sponsored scholarships to attend 4-H Camp Timpoochee and will earn the right to represent Wakulla County at the District Finals competition in Liberty County. The overall 6th grade winner will also have the opportunity to serve as the teen emcee for the 2020 county competition. Wakulla will be one of eight counties with students competing at the District Finals in Liberty County on May 4. Admission to the April 11 and May 4 events is free and both events are open to the public. For more information, email r.pienta@ufl.edu or call 850-926-3931.